Last year, guest contributor Chris Turner made a case for using the 10-year average of nominal earnings in the cyclical P/E ratio made popular by Robert Shiller (Shiller uses an average of real earnings). See Alternatives to the Cyclically Adjusted Price-to-Earnings Ratio. Today I’m featuring a “thought experiment” Chris shared with me in a recent email. He uses the trailing twelve-month earnings (TTM) data published on the Standard & Poor’s website. 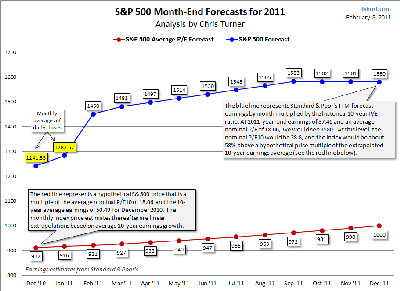 The latest 2011 forecast estimates are from the February 3rd spreadsheet maintained by senior analyst Howard Silverblatt. See my monthly valuation update for instructions on downloading the spreadsheet. The 10-year average of nominal TTM earnings is 50.49 as of Q4 2010, rising to 55.35 by the end of 2011. The average nominal cyclical P/E10 is currently 18.06. The S&P 500 historic prices used in the calculations are monthly averages of daily closes. Standard & Poor’s estimates of TTM earnings for Q4 2010 through Q4 2011 are 76.86, 82.00, 84.73, 87.63 and 87.46 (as of February 3 spreadsheet). 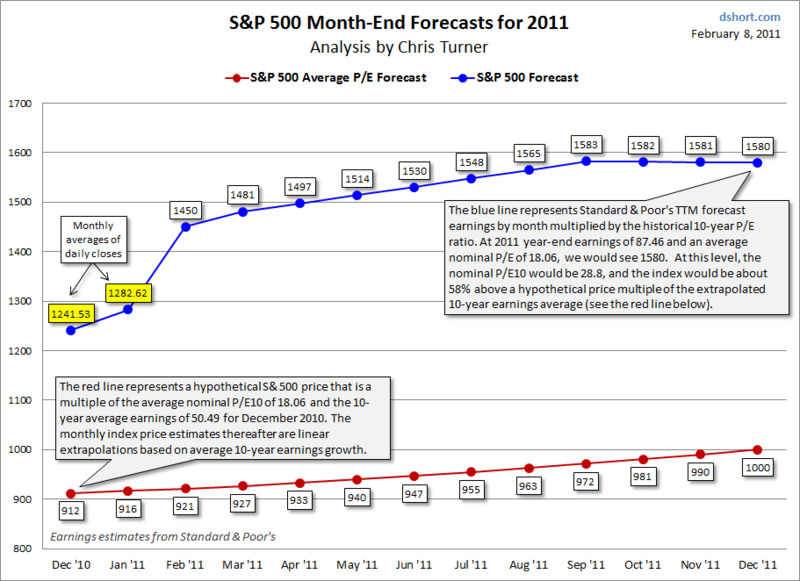 The blue line represents Standard & Poor’s TTM forecast earnings by month multiplied by the historical 10-year P/E ratio. At 2011 year-end earnings of 87.46 and an average nominal P/E of 18.06, we would see the S&P 500 at 1580. At this level, the nominal P/E10 would be 28.8, and the index would be about 58% above a hypothetical price multiple of the extrapolated 10-year earnings average. The red line represents a hypothetical S&P 500 price that is a multiple of the average nominal P/E10 of 18.06 and the 10-year average earnings of 50.49 for December 2010. The monthly index price estimates thereafter are linear extrapolations based on average 10-year earnings growth. The optimistic view (blue line) would put us at the 1500 level in the S&P 500 by late spring, the assumptions being that the Standard & Poor’s earnings forecasts are correct the nominal P/E10 ratio is the multiple we see. The pessimistic view (red line) is a reversion to the historic earnings and nominal P/E10 multiple. But history shows us that, regardless of your preferred earnings divisor (nominal or real, TTM or 10-year average TTM), the P/E ratio has never hovered around the average. The market swings above and below its long-term average valuation in erratic arcs that can last for many years. For a long-term perspective on valuation extremes, see Three Market Valuation Indicators. We’ll revisit Chris’s chart periodically throughout the year.